Sink a putt here and win two tickets to the BMW Championship next month in Lake Forest. WEST LOOP — Golf fans pining for a chance to see the BMW Championship in Lake Forest next month can do so for free by sinking a putt Downtown. 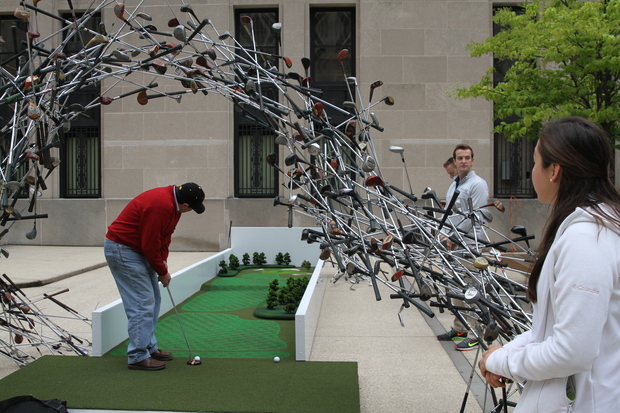 A putting range meant to mimic the tournament's 17th hole at Conway Farms will be by the office building at 2 N. Riverside Plaza through Sept. 4. There, contestants will have two chances to win two tickets to the tournament, which is one of four PGA playoff events, by nailing a hole-in-one. The putting range will be open now through Sept. 4 from 11:30 a.m. to 1:30 p.m., and from 3:30 p.m to 5:30 p.m.
Putters will have to handle a slight bump up to the hole, but also line up under an arch of golf clubs put together by Chicago artist Christophe Gausparro. It's the latest art installation for 2 N. Riverside, a riverfront building that has previously hosted "the world's largest camera" and an ice sculpture of Olaf from Disney's "Frozen" on its plaza. "It's probably the most interactive piece," the plaza has done, said Bill Bartolotta, the building's creative director. 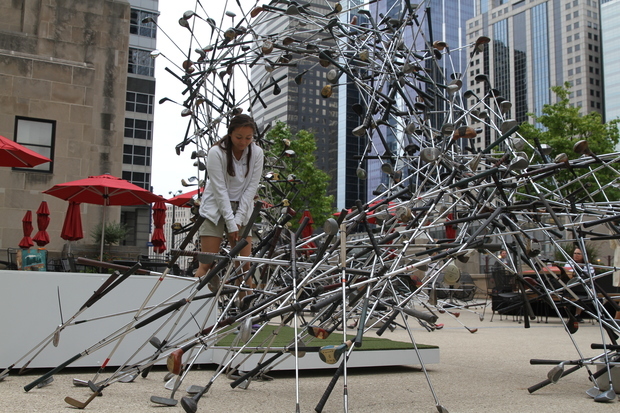 Gausparro, a West Town-based artist, said it took him about six weeks to collect the more than 500 golf clubs for the piece. It also includes 1,600 zip ties. The contest is also meant to raise awareness for the Evans Scholars, a foundation that awards college scholarships and housing to caddies. The scholars will be on-site to provide putters and balls to contestants. The BMW Championship tees off Sept. 17 at Conway Farms.